The development of optical continuously variable bandpass filters is presenting an alternative approach for hyperspectral imaging techniques, making it more appealing to volume markets. Hyperspectral imaging (HSI) has been used for a couple of decades in applications such as satellite imaging, air reconnaissance and other markets that are not price sensitive. Still, there is no clear definition of the term. Sometimes techniques that produce 2D images with more than the typical three RGB colors — by including a near-infrared channel — are already called hyperspectral. However, this is not always considered sufficient. Typically, even 10 spectral channels are still called multispectral rather than hyperspectral. • For every pixel in the image, the spectrum of the incident light or radiation must be measured. • The measured spectrum must be continuous and not discretized to a limited number of channels or bands. • The spectrum must cover more than one subwavelength range (such as UVA, VIS, NIR and SWIR). The advent of alternative approaches makes HSI attractive for volume markets and even consumer products. This can include cancer detection, precision farming with unmanned aerial vehicles (UAVs) or directly at the plant, and food testing in supermarkets. Alternative approaches comprise sensors that are coated at wafer level with fixed wavelength bandpass filters. Thin-film coatings are also common on glass substrates that can be patterned during deposition in situ, or by using a photolithographic process over the coating to block the addition or subtraction of materials deposited on the substrate surface. These micropatterning techniques allow for filters that have a staircase of different center wavelengths in one direction (also called stepped filters), suited for the so-called push broom technique, or 2D mosaics, which are suited for the snapshot technique. Based on the above criteria, these solutions do not provide hyperspectral capability, but are inherently multispectral because of their discrete changes in center wavelength. Typically, between 10 and 100 different wavelengths or channels are offered. A truly hyperspectral sensor offers a continuous change in center wavelength and, as such, a virtually unlimited number of channels. Continuously variable bandpass filters (CVBPFs) (Figure 1), such as those developed and manufactured by Delta Optical Thin Film, are designed for midsize and full-frame CCD/CMOS sensors (25 × 25 mm or 24 × 36 mm). They are coated with silicon dioxide and metal oxides on a single-fused silica substrate without the use of glue, color glasses or thin metal layers. Such filters offer very high transmission levels and are fully blocked in the light-sensitive wavelength range of silicon-based detectors (200 to 1150 nm or higher). Figure 1. Continuously variable bandpass filter-based hyperspectral imaging detector. Courtesy of Delta Optical Thin Film A/S. The combination of CVBPFs and silicon detectors allows the design of very compact, robust and affordable HSI detectors that offer several advantages and benefits over conventional approaches. Among them are huge aperture compared with grating and prism, higher transmission than grating and prism, short measurement time, high suppression of stray light and excellent signal-to-noise ratio (SNR). Although initially designed for a nonimaging application in an absorbance reader, the linear variable bandpass filters (LVBPFs) from Delta, with a center wavelength range of 400 to 700 nm, can be used for HSI. Such thin-film filters are coated with silicon dioxide and metal oxides on a single-fused silica substrate without the use of glue, color glasses or thin metal layers. This results in filters that are very robust against environmental conditions such as temperature and humidity and are spectrally and mechanically stable. The filters can be used long term in airborne or space applications without any degradation. Figure 2. Transmission and blocking characteristics of a linear variable bandpass filter. Courtesy of Delta Optical Thin Film A/S. The transmission characteristics of an LVBPF (Figure 2) can cover a center wavelength range of 450 to 880 nm with a bandwidth of approximately 2 percent of its center wavelength. In a wide wavelength range, the transmission is higher than 90 percent. The transmission below 550 nm is underestimated because of the limited ability of a spectrophotometer to resolve narrow bands. A new camera-based test system now in development will reproduce the peak transmission of narrow bands more accurately. But even more important than the peak transmission is that all undesired radiation from 200 to 1150 nm is suppressed by at least a factor of 10,000 or to a level better than OD4. Because of the diffractive nature of gratings or prims, their use requires a certain large distance between a sensor and diffractive element. This results in a large instrument prone to misalignment due to mechanical influences. Furthermore, a slit is needed to obtain high spectral resolution (Figure 3). The slit limits the light throughput considerably, and the signal-to-background light level is typically not better than 1000:1. Figure 3. Design of a classical hyperspectral imaging camera with grating. Courtesy of Headwall Photonics Inc.
CVBPFs, on the other hand, can be mounted directly on top of or close to a sensor. The resulting detector is compact and robust at the same time. The optical design does not require the use of a slit. Light is collected through the full aperture of the lens, and together with the high transmission and optical bandwidth of the filter, the HSI camera becomes very light efficient. The deep broadband blocking of the filter ensures a high signal-to-background ratio and eliminates spectral crosstalk. Figure 4. Image acquisition and workflow with a filter-based hyperspectral imaging camera. Courtesy of Glana Sensors. Without a slit, every acquired image shows the complete scene. This makes it possible to use the so-called step-and-stare technique. It allows users to arbitrarily image the scene from different positions without the need for precise synchronization of lateral movement and image acquisition, such as with the push broom technique. With the step-and-stare, it is possible to construct the hyperspectral data cube using image pattern recognition techniques (Figure 4). What makes wafer-level coated detectors attractive is the possibility to coat filters in arbitrary patterns on small imaging sensors. Small size can be a crucial factor in certain applications. The same is true for snapshot capability (acquisition of the hyperspectral data cube with only one image). In this case, the sensor is coated with a 2D pattern of bandpass filters with different but constant center wavelengths. However, the snapshot capability comes at the cost of reduced spatial resolution. Another typical trade-off of coating at wafer level is the limited spectral complexity of the filters. Imec, for example, offers simple Fabry-Perot filters that do not create sharp bands and have strong side bands that limit the overall wavelength range and the obtainable SNR. Delta’s filters are suited for larger sensors. To maintain high performance and large wavelength range, such filters cannot be made smaller than 20 mm in the variable direction with current production technology. An approach to enable snapshot HSI with LVBPF has already been demonstrated and makes use of 2D lens arrays (plenoptics cameras) that are used in light-field cameras1. For some applications, such as precision farming or quality control of manufactured components, it is advantageous to combine hyperspectral data with 3D surface information2. In precision farming, this provides information on nutrition and health of crops, as well as height and growth. However, it is hard to imagine how the height information could be extracted from traditional hyperspectral cameras that use slits and only image a narrow slice of the object. This is especially true under imaging conditions in which the relative movement between camera and object cannot be precisely controlled, as with UAVs — even with snapshot cameras that might prove difficult because their limited spatial resolution might not be sufficient for 3D reconstruction. On the other hand, hyperspectral cameras using an LVBPF or a CVBPF have superior spatial resolution that allows 3D reconstruction of the imaged scene by standard stereoscopic image processing. This makes use of the fact that each object in the scene is viewed from different angles while passing by (Figure 5). Figure 5. Relative movement between the camera and object enables 3D hyperspectral imaging. Courtesy of Delta Optical Thin Film A/S. Three approaches have specific strengths: 1) Classical hyperspectral cameras with gratings and prisms achieve the highest spectral resolution and are well suited for demanding applications in research. 2) Sensors that are coated at pixel level allow the most compact cameras, offer total flexibility with respect to filter pattern and are readily suited for snapshot imaging. 3) Cameras based on CVBPF combine high light efficiency, high SNR and high spectral resolution with compactness and robustness. An in-depth discussion is made available by Renhorn and colleagues3. Although some of the filters discussed above are called linear variable filters, they are typically not perfectly linear with respect to center wavelength versus position on the filter. This can easily be compensated by a calibration curve or a one-time calibration of the assembled detector. However, there are good reasons for designing filters that are deliberately nonlinear. As can be seen from the previously mentioned transmission curves, the bandwidth is proportional to the center wavelength. This is a natural property of the multicavity design that is used in the filters. Consequently, if light of 450 nm is compared to 900 nm, there are twice as many neighboring pixels on the sensor that see light of 900 nm as there are pixels that see light of 450 nm. This can be compensated with an exponential relation between center wavelength and its spatial position on the filter. And other design targets are possible. Filters that cover a larger wavelength range over a shorter length are desirable. Currently, filter designs in production can cover 450 to 950 nm over 36 mm with an exponential dispersion function. 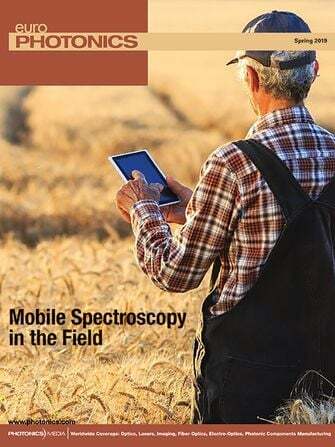 While HSI is emphasized, it should be mentioned that the same technology can be used to replace gratings in compact spectrometers, making them even more compact. Ultrahard coating technology allows the filters to be diced into very narrow stripes that can be mounted in front of a line scan detector. This concept has been used in wearable devices to measure the oxygen content of blood. Another promising application is the fusion of fluorescence microscopy and HSI as hyperspectral fluorescence microscopy. The technology is applicable to both laser scanning microscopy and wide-field microscopy4. Oliver Pust is director of sales and marketing at Delta Optical Thin Film A/S; email: opu@deltaopticalthinfilm.com. Henrik Fabricius serves as CTO at Delta Optical Thin Film A/S; email: hf@deltaopticalthinfilm.com. 1. P. Stanley et al. (2016). Hyperspectral Imaging Using a Commercial Light-field Camera. CSEM Scientific & Technical Report 2016, p. 111. 2. J. Ahlberg et al. (2017). Three-dimensional hyperspectral imaging technique. Proc SPIE, Vol. 10198. Anaheim, Calif.
3. I.E. Renhorn et al. (2016). High spatial resolution hyperspectral camera based on a linear variable filter. Opt Eng, Vol. 55, Issue 11. 4. L. Gao and R.T. Smith (2015). Optical hyperspectral imaging in microscopy and spectroscopy: A review of data acquisition. J Biophotonics, Vol. 8, Issue 6, pp. 441-456.